There are many things to remember throughout the day but taking your medicine is the most important. Unfortunately, many people forget to take their medicine daily because they are overwhelmed with the number of pills and the hourly dosages. It is shocking to find out how many people forget to take their pills for life threatening conditions. Without a caregiver to offer assistance, it can be hard to keep track of when to take it. Luckily, a solution to this problem is medicine reminders. Devices such as a medicine alarm clock or other medicine reminders make it easier to remember to take medications when they need to be taken. Here are some helpful ways for the elderly to track medication. These may include such devices as medicine alarm clocks or pill reminder watches. The time a particular pill is supposed to be taken is set on the alarm clock or watch and an alarm goes off when it is time to take your medicine. Any helpful medicine reminder aids that can help your elderly mom or dad take their pills on the right day, at the right time and of the right amount, will also help to take the caregiver stress load on your back. It is one less thing to worry about. AARP and the American Seniors Association have both supported medicine reminders as a way to remind those who depend on medicine daily. 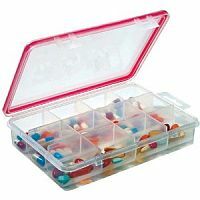 Pill organizers are another way to keep track of medications. Colorful weekly pill organizers for the elderly cost very little, with most people under $5. Many organizations also give them away for free. These are simple aids like handicap reachers and low vision aids that allow the elderly to maintain their daily lives without extra frustration. Here is a list of recommended products to buy like handicap pill organizers, medicine alarm clocks, and portable medicine travel bags. Medicine Reminders with Alarm Clock – This elderly medicine alarm reminder system is a day, month and time clock alarm for the elderly and anyone taking a lot of pills on a daily basis. 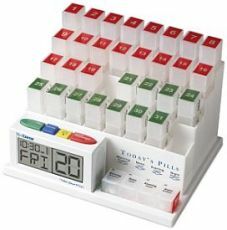 Highly rated and recommended clock to help remind an individual take their pills on time, with the right dose, on the right day. 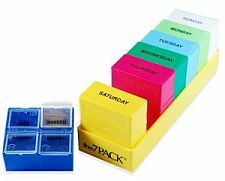 Colorful Weekly Pill Organizers – Separate your pills each day with color. Portable Pill Reminders For Travel – Easy to carry compact medication bag for one week of pills. 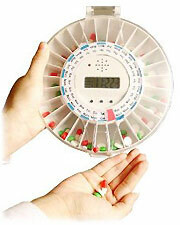 Automatic Pill Dispensers – Good for one week of medications if dispensed four times a day. Good for 14 days if pills are dispensed twice a day, and 28 days if pills are given once a day. Built in buzzer will continue to buzz sounds until pills are removed. Medication Reminder Watches – Easy way to keep track of daily pills. A perfect portable reminder to take meds on time. 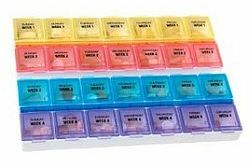 Monthly Pill Planners – There are 28 medicine pill boxes or 4 weeks’ worth. A single pill compartment can hold 25 aspirin tablets. Air Tight Medicine Containers – These medicine containers keep your medicine fresh in 12 rounded bottom compartments. Vibrating Alarm Pill Reminder Boxes – These come with 4 daily alarms with 4 cases for pills. It is able to fit in your shirt pocket. You can switch between a vibrating alarm reminder or a beep alarm reminder. Some medicine reminders offer monthly reminders of when to take pills each day for an entire month and serve as a reminder to let you know when it’s time for refills. Such products range in price. Some monthly reminder systems are available for under $20, while others that are more elaborate can cost upwards of $100. For example, the medcenter monthly medication system with reminder alarm price can run anywhere from $45 to $60 but is well worth the costs. Ultimately, it depends on your specific needs. Some pharmacies will provide monthly phone reminders on refills of medications. Other helpful aids that helps remind the elderly to take their medicine are phones with medication reminders services. They are a service that calls to remind seniors to take medication. Doctors and pharmacists alike agree that it is important to take daily medications on time. Missing a dose can lead to confusion. Doctors recommend that if a dose of a medication is missed, you should just wait until your next scheduled dosage and skip the one you missed. A double dose should usually never be taken, as this may cause adverse reactions. With the increase of prescribed meds that one must take daily, people forget to take their medications and pills on time. By using these simple reminders for taking medicine like medication organizers for seniors, pill organizers for travel use, portable alarm clock pill reminders and watches that keep track of the time for taking your pills, you can be assured that you or your loved ones will take the meds on time. How Can Low Vision Aids Improve the Life of the User?